Were you looking for the structure from Halo Wars or the Temple of the Abiding Truth? An anti-gravity gondola docked at the temple's entrance. 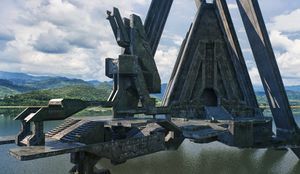 The Temple was a Forerunner structure located in the center of a large artificial lake on Installation 05. The structure was occupied by the Prophet of Regret during his brief stay on the installation. The only way to the temple without a dropship or aircraft was by taking a route through a series of underwater tunnels, over bridges and by traveling on anti-gravity gondolas across a system of towers and other structures across the lake that surrounded the structure. The purpose of the temple structure was never discovered before it was destroyed by a Covenant assault carrier shortly after the Master Chief assassinated the Prophet of Regret. The temple was a symmetrical structure that rose out of the water on six legs, with two gondola docking places. It had one main entrance to the interior of the temple, and a hallway that led to two more openings. Through those openings was another large room. In this room were two small doors in the far left and right sides of the walls. They, along with a large ramp leading to a door were the entrances to the main hall. In this large room, there were four doors in the walls which led to small rooms. There were walkways and three levels. On the ground level there were various blocks and a pond. At the far end there was a raised platform where, in 2552, the Prophet of Regret conducted his sermons. Regret was slain in this room by John-117 in November 2552, and the temple was destroyed by an assault carrier's energy projector shortly after. The Prophet of Regret in the inner chamber of the temple. Following his retreat from Earth, the Prophet of Regret's assault carrier Solemn Penance exited slipspace near Installation 05. The Prophet immediately deployed ground troops to the surface of the ring while he situated himself in the temple and immediately began his sermons. He was supported by a large number of Sangheili Honor Guardsmen and various other Covenant troops. The exterior was fortified with Shade turrets. Unfortunately for Regret, his ship had been followed through slipspace by the UNSC frigate In Amber Clad. Upon arrival at the Halo ring, the ship deployed a large force of ODSTs along with Spartan John-117 into the surrounding area with the objective of assassinating the Prophet Hierarch. Despite the Covenant's best efforts, the UNSC force managed to clear the ruins around the lake and eventually the other structures in the lake were cleared of Covenant forces. With the human "demon" closing in on his location, Regret readied all forces in the temple for the Spartan's inevitable arrival. The Master Chief eventually made it to the temple himself, clearing out the many Shade turrets on the exterior before moving in to the central chamber itself to confront the Prophet. The Covenant Holy City High Charity along with its vast defense fleet exited slipspace above the temple. The fleet deployed multiple waves of Phantom dropships to reinforce Regret, but these were ultimately called back by the Prophet of Truth. Despite fierce resistance from Regret's Honor Guards as well as the Prophet himself, the Spartan was able to board Regret's throne and beat the Hierarch to death. Immediately after, the fleet prepared to fire on the temple. The Master Chief barely escaped, diving into the lake as the temple was completely obliterated by an energy projector. In the water, the Master Chief was rescued by the Gravemind who eventually used the ring's translocation grid to teleport him to High Charity. A view of the temple. The Solemn Penance hovers in the background. A view of the temple lake from a distance; the temple itself can be seen to the left. A view of the Temple with the Solemn Penance hovering above, as seen in Halo 2: Anniversary.